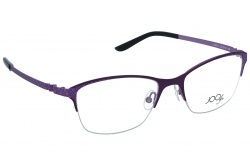 Joo ly glasses stand out for its designs made with the latest technology. All their products are intended for women who has a very high interest in fashion. Joo ly defines itself with the concepts of love, courage and will. This brand offers to each woman the possibility to show its own style and personality. Its products have a great number of details and during the manufacturing process they take good care of all their products. All these combined make Joo Ly a high quality fashion brand. All products fom this brand have comfortable and resistant designs. Anyway, its great variety of styles makes easier to find the model that adjusts better to your personality. Its products are easy to combine and provide a sophisticated look, bold and elegant. In our online shop you will find the best Joo Ly models at best price. During the purchase process you can ask any doubts to our professional team. The brand was created by the designer Aurelia Devillers, who looked for a combination of her fashion interest and the eyeglasses design. Also, all their glasses include illustrations by the artist Florence Bossard. In this way, the products have unique personality and inspiration. Nowadays the brand belongs to the Oxibis group.